Year-after-year Milwaukee Panther head baseball coach Scott Doffek puts an entertaining and competitive team on the diamond, but very few people in the community seem to realize it. 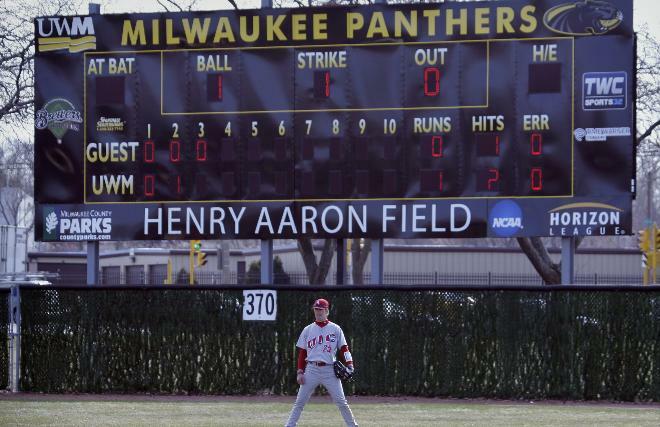 The Panthers are the only Division I baseball program in the state of Wisconsin, but the dreadful state of their facility keeps the program in obscurity. Henry Aaron Field, home of the Panthers, is a glorified high school baseball diamond that is not suitable for a college baseball program. While it should not matter as long as you have a field to call home, it does make a huge impact on the Panthers’ baseball program. Even though the Panthers have been able to be a competitive program throughout the years, “The Hank” makes it even harder to lure some of the top high school players in the state. This is completely true. That is exactly why the athletic directors in the past and current AD Amanda Braun have made it a priority to improve the baseball facility. However, Braun did something none of her predecessors were able to do – announce a plan for a new facility. At the end of 2014, it was announced that the Panthers were joining forces with MKE Sports & Entertainment LLC to construct a 4,000-seat multi-use stadium at an unspecified site in Oak Creek, Wis. by 2016. Braun stated that they considered numerous options, including Concordia University’s Kapco Park in Mequon, Wis. and also even building their open ballpark. But, right now she felt that it made the most sense to sign a lease agreement and have a plan in place immediately. However, Braun was extremely confident that everything would work out, as Mike Zimmerman, owner of MKE Sports & Entertainment LLC, was pretty aggressive in getting them on board. Oak Creek’s mayor, Steve Scaffidi, is also an UWM alumnus, and Braun said he was thrilled to have the Panthers apart of this project. She also isn’t worried about the field being farther away from campus compared to Henry Aaron Field, or investing in the baseball program despite being in Wisconsin and the weather having such a big impact on the season. “Sure there is a risk, but you navigate it with scheduling and you work with what you got,” said Braun. “I think the artificial turf world has made it more possible to survive and thrive in a northern climate. Once the Panthers move into the newly constructed facility in Oak Creek, Wis., Henry Aaron Field will become their primary practice facility and FieldTurf will be installed, allowing them to use the field on a more regular basis despite the northern climate. Zimmerman is currently working with Milwaukee County to figure out the logistics of the deal to put FieldTurf in at “The Hank,” and hopefully it will be installed for the 2016 season. Despite the decision to partner with MKE Sports & Entertainment LLC, the Panthers are still open to the possibility of building their open ballpark if the opportunity would arise. The biggest issue is finding available land near campus, something Braun hasn’t been able to discover. “Building our own (ballpark) – absolutely we would love to do that,” Braun said. “I would say being at UWM, one of the most amazing and wonderful things about it is that we are right here in the awesome community of Milwaukee. But, one of the most challenging things about UWM is that we are right in the heart of Milwaukee. “That presents challenges in terms of location and where we could be. So we just haven’t been able to figure that out. Regardless of the likelihood that they eventually build their own ballpark, the Panthers are in a great position to be playing in a state of the art baseball facility along with having a respectable practice field. The Panthers will finally have a place to call home that they not only take pride in but also are proud to show off. This will instantly give Coach Doffek an advantage in recruiting, and will hopefully convince top high school prospects to remain instate and play for the Panthers. Coach Doffek has done an incredible job building a consistent winning program, and with the new ballpark it has the potential to take Panther baseball to the next level. “I think it will be big for recruiting,” Braun said. “It is going to be a great asset for Scott (Doffek), and make our student-athlete experience really wonderful. “From what it sounds like and from what I have heard from Mike Zimmerman, MKE Sports and Entertainment is going to do this well. They are very interested in having an impact on that community down in Oak Creek and greater Milwaukee. They are really interested in creating a quality facility.